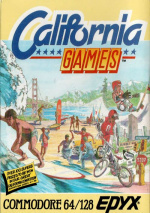 The fifth game in Epyx’s highly respected multi-event sports game series, California Games offered just 6 events, as opposed to the 7 or 8 of previous instalments. That’s not to say it suffers as a result, because some of the new events arguably have a lot more depth than, say, sprinting or weight lifting. As in the earlier games, you first pick what events to play, then set up your players by entering a name and choosing a sponsor (rather than a country). None of the events allow for simultaneous play. Half Pipe Skateboard kicks things off, with a 75 second time limit to perform as many stunts as you can. There are three possible moves: a kick turn, executed toward the bottom of the pipe; a hand plant, performed at the lip of the pipe; and an aerial turn, carried out above the pipe. The first two are fairly straightforward, but an aerial turn requires very good timing! The speed of your movement is an important factor for success, and should you fall three times, the event is over. Hand plant gives higher scores for holding on longer, but be careful not to linger too long! Foot Bag is next and timing really is everything here, as you use your feet, knees, and even your head to keep the bag aloft. There is no penalty for dropping the bag or kicking it off screen, but it wastes time. Putting together combinations is a lot of fun, and there are other nice touches such as being able to hit the bird flying overhead for a bonus. You also receive a score at the end based on how varied your moves are, so it pays not to do the same thing repeatedly. Surfing follows, and you get slightly longer (90 seconds) to ride those waves. Unlike the other events, scoring is by a panel of judges, who base their rating on the risks you take and stunts you pull off. Wiping out doesn’t impress them; do this four times and it’s time to come ashore. This is the weakest event of the six as it feels more limited in what you can do, but it’s by no means awful. The shark or dolphins that can appear when you wipe out are amusing. Roller Skating provides the fourth challenge, and a lot of entertainment too. As you skate from left to right a variety of obstacles have to be avoided or jumped, with higher scoring given for the latter. Spinning whilst jumping leads to even bigger scores. There is no time limit, but falling over three times ends your go (as well as looking pretty funny). BMX Bike Racing is the penultimate event, with a two minute time limit to finish the course. Again going from left to right, you can perform various tricks whilst going over the jumps and bumps, earning scores according to the difficulty and execution of each stunt. With a strict limit of only one serious fall, or three easy falls, finishing the course is easier said than done. You tend to try and perform outrageous stunts without the height or speed needed to finish them in time! Very entertaining, and a contender for best event in the game. Flying Disk completes the set, in this simple to play but hard to master event. You have three attempts to throw the disk, with the aim being to catch it using the second person at the other end of the field. Throwing is fairly easy, but being in the right place and having the timing to catch the disk is another matter entirely. With more points given for making a diving catch or grabbing it straight above your head, you also have to decide which method you are going to attempt. An enjoyable event, and quite comical when you dive for a disk and miss it completely. As with all Epyx sports titles, the graphics are of an extremely high standard and each event is full of small details that bring it to life. Presentation is also very good; with the familiar menu system used to set everything up it couldn’t be easier to get going. The music is jolly without being irritating, and the sound effects are well implemented. The controls are responsive and, once you get used to each event’s particular requirements, easy to manage. The main problem with California Games is one that besets all sports games – it’s much better with more than one player. Having friends to compete against is far more satisfying than trying to improve your personal best. Having said that, this is a great collection of events (with the possible exception of surfing) and can still be enjoyed on your own. If you are looking for something different from your usual track-and-field type of sports game, and especially if you have somebody to play against, then this comes highly recommended. If you don’t normally enjoy competing alone then there’s probably nothing here that will change your mind. For everyone else this is a worthy purchase and a welcome addition to the Virtual Console. I hope we get this next week in America, looks awsome and great review. Always a favourite when I was wee - though why it clocks in at a massive 62 blocks is a mystery to me. That's the size of F-Zero and Punch-Out! Despite that point, it's fun for a nostalgic burst, but like Golden Axe: not as good as you remember. 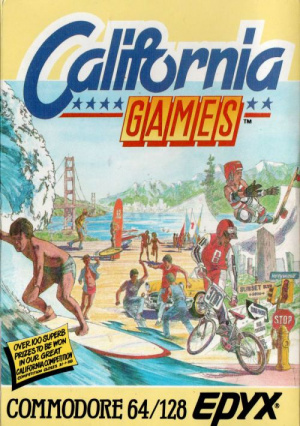 As much as I like California Games, this version just does not play well on the Virtual Console. Be prepared for some frustration with the controls. I think it would be better to have a console version like the NES of Genesis on the VC. I would have preferred the NES version.